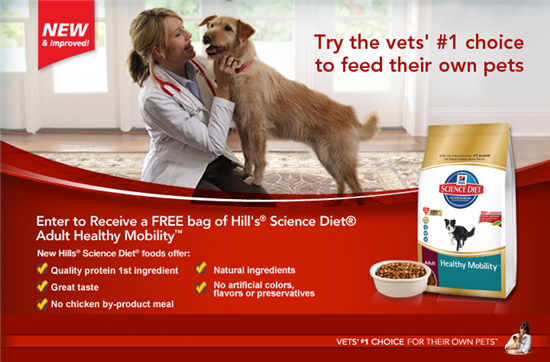 Head on over and enter to WIN a FREE bag of Hill’s Science Diet Adult Healthy Mobility dog food – they’re giving away 400 this week! It’s got chicken as the first ingredient and NO chicken by-product meal, artificial colors, flavors or preservatives. Even if it’s not your dog’s brand, consider entering as this prize makes a great donation item for your local shelter or rescue organization! Enter at Hill’s Facebook Page here by March 3, 2013. Hurry on over and enter to WIN 1 of 400 Free Bags of Hill’s Science Diet Hairball Control Cat Food. Just fill out the easy entry form by 2/24. Makes a great donation item, even if it’s not your cat’s regular brand…Good Luck everyone! 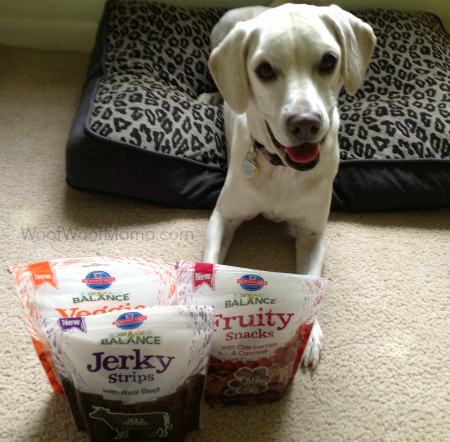 FREE Bag of Science Diet Ideal Balance Dog Treats ($6.99 value) w/ Printable Coupon! Daisy had the chance to try 3 varieties of the new Ideal Balance dog treats from Science Diet, thanks to a Klout Perk we received recently. She’s been sharing with her pal Stella who is visiting this weekend and they both seem to enjoy them a lot! Now you can snag a bag of these yummy snacks for your pup for FREE with this printable PetSmart Coupon from their Facebook tab of pet coupons and deals. You’ll be asked to provide your name and email address then you’ll be able to print a coupon good for a free bag of treats, up to $6.99 value! Hurry though because the coupon I just printed says it expires 10/14/12! Visit PetSmart on Facebook to get this freebie while it lasts! Update: Depending on when you try, the coupon may be temporarily unavailable when you try to print it. In the past, offers like this reset every so often to spread out the number of free products over a longer period of time. If this happens, check back on Facebook later or leave a comment on their page to find out when they will offer more! Find LOTS more great freebies like this one at FreeFlys! It’s free to join! 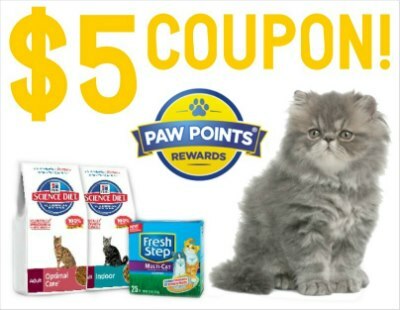 $5 Fresh Step Cat Litter Coupon with Paw Points Rewards! Fresh Step has a new coupon available for their Paw Points Rewards Members! 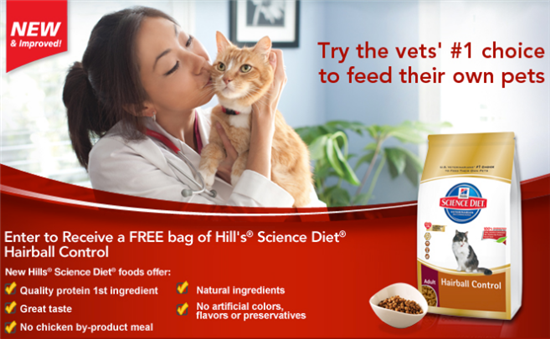 Get $5 OFF with this special Fresh Step Coupon when you buy Hill’s Science Diet Optimal Care or Indoor cat food (15.5 lbs. or larger) AND Fresh Step cat litter (25 lb. box or larger). Visit Paw Points Rewards for more info on how to collect and enter codes for coupons and more rewards including $3 OFF coupon for Any Scoopable Fresh Step Product! 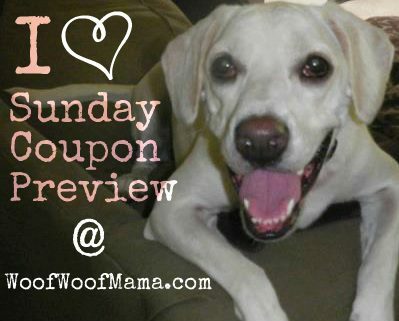 Sunday Pet Coupon Preview 9/16: Hill’s, Nutro, Purina ONE + more! Looks like there will be a Redplum and a SmartSource coupon insert in the Sunday paper this week. Here’s a brief rundown of the coupons of interest to Pet Parents. Be sure to head on over to Sunday Coupon Preview for the entire list of ALL Newspaper Coupons to expect this Sunday, including coupons for groceries, cleaning, personal care and more!